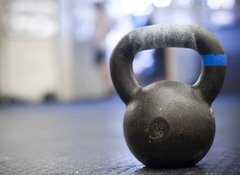 Kettlebell training improves daily function, confidence in weight lifting, fitness level, strength, stability, flexibility and overall well-being. This class provides a fun, dynamic workout and does not require advanced knowledge or a background in resistance training. Through instruction and demonstration you will learn how safe, easy and fun kettlebell training can be. Participants can join in at any time.